Hersh Fine Art is pleased to announce the upcoming Loved and Observed, a group exhibition of portraits by twenty-three artists co-curated by Diana Corvelle and Manu Saluja. In the sprawling genre of female portrait artists, the one place to find commonality is in the choice of subject itself. Whether her subject is a family member, friend, or the artist herself, that person has been singled out among many. They have been conferred a special status by virtue of the time and energy given over to observing and documenting their distinct presence. Artists Corvelle and Saluja bring together a dynamic collection of classically trained women whose approach to portraiture ranges from delicate to bold, traditional to nonconformist.Portrait artists offer a rare opportunity to see someone as they themselves do. We become familiar with perfect strangers. We are allowed into intimate spaces we might never have seen. We are treated to narratives that make us question the very notion of individuality. We are invited to love and observe.Loved and Observed will be on view from June 21 through August 12, 2014 at Hersh Fine Art, located at 14A Glen Street in Glen Cove, NY. An opening will be held on Saturday, June 28 from 6-8pm. For more information, please contact Steve Forster at info@hershfineart.com. Participating artists: Elizabeth Adams-Jones, Erin Anderson, Juliette Aristides, Julie Elizabeth Brady, Aleah Chapin, Diana Corvelle,Michelle Doll, Alia El-Bermani, Alexandra Evans, Shauna Finn, Nanette Fluhr, Nanci France-Vaz, Kristy Gordon, Clarity Haynes, Leah Lopez, Gaetanne Lavoie, Lauren Amalia Redding, Kay Ruane, Manu Saluja, Holly Ann Scoggins, Rabecca Signoriello, Emily Slapinand Maria Teicher. 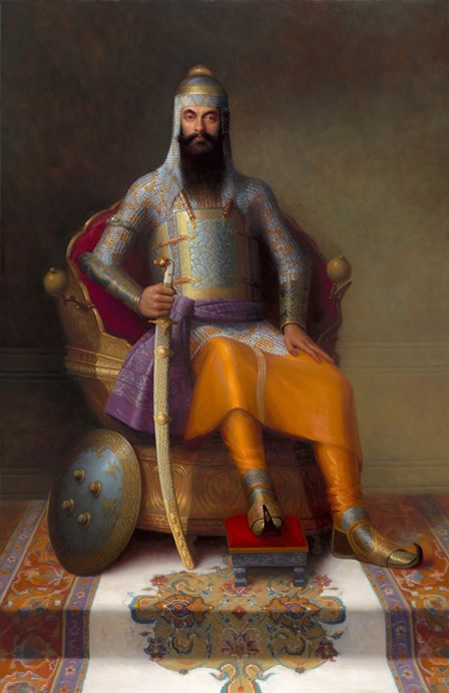 On Exhibit at the Royal Ontario Museum: Manu Saluja's "Kings of the Punjab"
"Maharajah Ranjit Singh" unveiled at the Royal Ontario Museum. Presentation at the Asian Art Museum of San Francisco. In June, 2003, Manu Saluja was invited to the Asian Art Museum of San Francisco to speak at the opening of the Satinder Kaur Kapany Gallery of Sikh Art. This was the first venue where she talked about the research and planning for her painting of Maharajah Ranjit Singh, which included photos of the armor, shield, turban helmet, concept drawings, and historical background information.